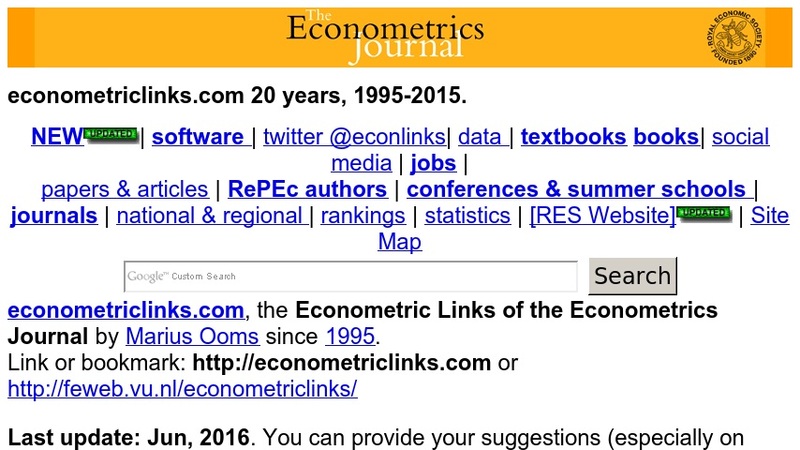 The econometriclinks.com website is a collection of Econometric Links offered by the Econometrics Journal. The links covered include time series analysis, microeconometrics, labormetrics, cliometrics, finance metrics, risk metrics, credit metrics, crash metrics, pension metrics, analyst metrics, Web metrics, econophysics, environmetrics, spatial econometrics, markometrics, marketing research, customer service metrics, inventory metrics, demand metrics, psychometrics, medicometrics, and other schools of applied statistics related to (inter)human behaviour. (Econometrics theory is not included). The website is intended to support anyone teaching econometrics. The links are organized so that newly added links are listed at the top of the page followed by a section listing Econometricians. The remaining sections provide links to Econometrics papers, such as preprints, articles and dissertations; econometric software; code and data; (metadata) data sources (which are listed alphabetically); news lists; conferences and summer courses, and journals. The entire table of contents can be searched using a Web browser. Visitors are encouraged to email their additions, especially conferences.